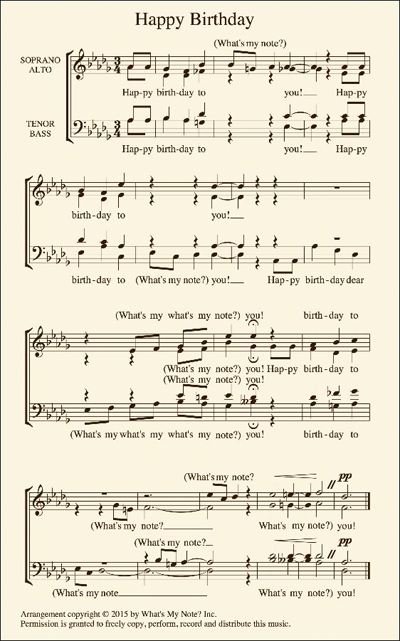 Record a video of your quartet performing our arrangement of Happy Birthday. Click the image to download a PDF of the sheet music. Use our app to learn the notes. The person filling out the entry form must be 16 years of age or older. Singers can be a regular quartet (two women and two men), a men's barbershop quartet (four men) or a women's barbershop quartet (four women). The music works for any of these combinations. Entries will be judged on musicality and theatricality. In other words, you must be able to sing accurately. But you also have to do something interesting while you sing. We are hoping for performances that are wildly entertaining and strikingly original. We will select a winner on December 1, 2016, unless we have less than three entries. In that case, we will extend the contest until we have a minimum of three entries. The winning team will be notified by email. They must respond within 48 hours, or the prize will be given to someone else. The winner receives $200 for the choral director and $200 for each singer. Winners agree to hold What's My Note?, its owners, affiliates, subsidiaries, licensees, sponsors, and agents harmless from and against any damages arising from their participation in the contest, and the receipt or use of any prizes. Purchase of the What's My Note? app is not required to enter.